The National Chairman of the Peoples Democratic Party, Prince Uche Secondus, has summoned a meeting of the top hierarchy of the party to discuss demands by those planning to join the former ruling party before the 2019 general elections. Those expected at the meeting, according to a notice circulated by the National Secretary of the party, Senator Umaru Tsauri, are the party’s presidential aspirants, all PDP governors, former governors, members and former members of the party in the National Assembly. 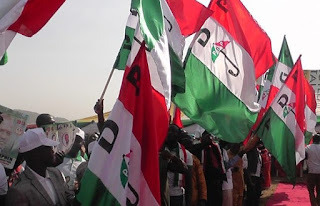 Others are members of the Board of Trustees, PDP former Ministers Forum and all the 37 state chairmen of the party, including the Federal Capital Territory, Abuja. The meeting, according to Tsauri, holds in Abuja on Monday (today) afternoon. Termed “crucial meeting “, our correspondent gathered that Secondus would use the occasion to explain the interim report of the party’s Contact Committee to the attendees. The committee, which is headed by a former Governor of Cross River State, Senator Liyel Imoke, was asked by the National Working Committee of the party to talk to aggrieved members of the All Progressives Congress and also liaise with former leaders in the country on how to wrest power from President Muhammadu Buhari in 2019. The committee was said to have met with former Presidents Olusegun Obasanjo and Goodluck Jonathan. Secondus told our correspondent that the Imoke committee had been working hard and that he would brief the party’s leadership “soon,” when asked last Saturday. Though details of the Monday meeting remained secret as of the time of filing this report on Sunday, investigations by our correspondent, however, revealed that Secondus would use the opportunity to brief the leaders of the party on the reconciliatory report by the Imoke committee. A top source in the party said that the demands by those expected to return to the party or join afresh from other political parties would be tabled for deliberation. The source said that majority of those aggrieved in the APC had agreed to return to the PDP but were said to have given some conditions. The source said, “The meeting on Monday afternoon will discuss the report of the Imoke committee and the demands of those who had agreed to return to us (PDP) or join us afresh. “These people want to extract some commitments from the PDP before coming. They are likely to have learnt from how they were treated in the APC as they were actually never accommodated and seen as crucial partners in the running of the party and the government they collectively formed. Asked if it would not be wrong to assure fresh members of positions before joining, the source said that negotiations were part of politics. “We all negotiate and agree on positions and offices. Besides, negotiation is a critical part of politics and life. So, their position is not strange, “the source added. It was learnt that some members of the National Assembly were rooting for automatic tickets from the party to contest in 2019. It was also gathered that some others were asking that they should be allowed to nominate their loyalists to join the members of the State Working Committees in their states and even at other levels. Among those who were said to have agreed to return to the party is a former Governor of Kano State, Senator Rabiu Kwankwaso, and the Governor of Sokoto State, Aminu Tambuwal. It was also gathered that the President of the Senate, Bukola Saraki, is being expected in the former ruling party. It was gathered that the meeting, which is an expanded caucus meeting, would also agree on waivers for the returnees to the party and its new members. Specifically, the PDP constitution says its new members are to spend six months before being allowed to contest any position. The Monday meeting, it was gathered, would empower the Secondus-led National Working Committee to grant new entrants automatic waivers to vie for any office of their choice in the party. Secondus told our correspondent that the party would grant the newcomers the waivers. Meanwhile, the PDP has called on President Buhari to list those that benefitted from the repatriated $322m. It also said that the government should make public, names and photographs of all those involved in the handling of the money. The party said President Buhari should do so to show his transparency as well as to enable Nigerians to know and see the faces of those superintending over the repatriated fund. The PDP, in a statement by its National Publicity Secretary, Mr. Kola Ologbondiyan, in Abuja on Sunday, challenged President Buhari to order the Attorney General of the Federation, Mr. Abubakar Malami (SAN ), as well, to make public, the APC interests and the owner of the consulting firm reported to have been paid billions of naira as consultancy fees for the “sharing” of the money, which he said did not pass through the constitutionally required approval of the National Assembly. He said, “President Buhari needs to note that Nigerians are utterly dismayed that having hitherto postured as a supporter of the ‘Talakawa’ and man of integrity, he has taken no steps against this bare-faced atrocity where over 90 per cent of supposed beneficiaries of the repatriated fund are phoney names supplied by fraudulent officials of his government. “Nigerians are completely at a loss on why President Buhari always fail to take bold steps to expose and deal with corrupt and sharp practice by his appointees and leaders of his APC, even when such nefarious acts are directly against the underprivileged citizens already suffering the harsh economic realities of his administration.